7:19 (2016) – What's New on Netflix Canada Today! It was 7:19 am when Mexico City was hit by the most devastating earthquake in the history of that country. In “7:19”, a handful of survivors from different social classes try to stay alive while they wait to be rescued. Martin and Fernando are at the reception of the building where they work. Suddenly, an earthquake buries them under seven floors of concrete and twisted metal. It is 7:19 am September 19, 1985. Martin and Fernando will have to reconcile all their differences in order to survive together; Now, more than ever, they have to tear down the borders between them. It was 7:19 am when Mexico City was hit by the most devastating earthquake in the history of that country. 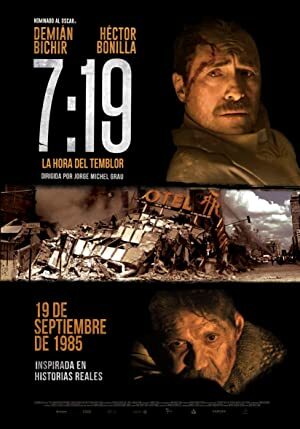 In "7:19", a handful of survivors from different social classes try to stay alive while they wait to be rescued.